When I wrote my first blog post back in April 2006 I had no idea what I was getting myself into. As I fell down the rabbit hole blogging gave me a reason to pick up my camera again. It rekindled my love of poetry and brought me friendships from all over the world. And now here I am, blogging under my own name, running a creative biz online and penning books — and all of this came from being brave and posting some words on the internet. In short, blogging has changed my life. My blogging practice has always been to share the light AND the dark of my life. Starting a blog 13 months into my bereavement influenced much of what I wrote back then, but in the years that followed I’ve continued to share in an open, and often emotional, way. Sharing our stories and experiences with one another helps us feel less alone. Just the simple act of getting the words out of your head and onto the screen can be powerfully cathartic. A blog is less a diary and more a magazine of you, a place where you can curate your interests and visual inspirations. 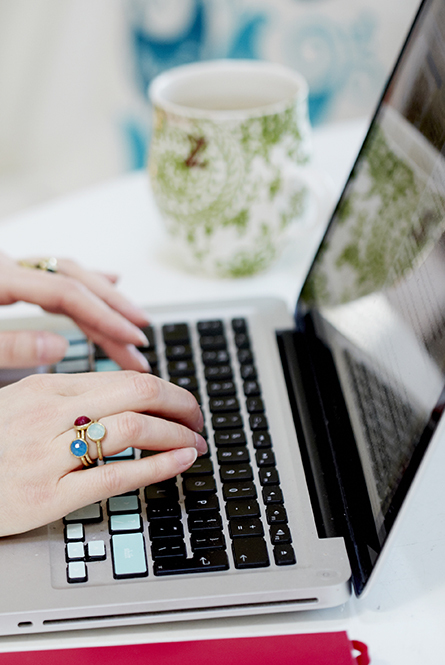 This 30-day course is all about creative personal blogging. I’ll teach you how to share your life and heart online as a way to express yourself creatively, dive deep and meet like-minded friends along the way. There’ll be lots of blog post ideas as well as interviews with creatives who inspire me. I won’t be looking at how to make money from blogging, but if you have a biz and want to share more of yourself online with your customers, then this course will definitely help with that. Crafting a blog that truly reflects who you are is about being honest and open, enjoying the writing process, recording your world with your camera and getting your creative juices flowing! Four videos + transcripts from me! In the first week we’ll explore some of the essentials of blogging, including figuring out our goals and intentions for blogging, getting our blog home in order, and identifying our ideal reader. In week two we’ll start blogging in earnest, finding and honing our writing voices, thinking about privacy online (an important topic!) and how much to share, and answering the no.1 question: what shall I blog about today? Week three is where we’ll dive deep into revealing more of ourselves on our blog, with musings on authenticity (and what that really means), vulnerability vs empowerment, and how to deal with blogger’s remorse. In week four we take a step back and consider how to infuse even more of ourselves into our blog homes, including tackling the all-important about page, design advice from my favourite web designer and thoughts on how to protect your space. It’s all about the visual in week five as we explore different ways to shoot for our blogs, share more of our world in photos, and tackle the question: what if I’m not a photographer? In the last week we’ll look at ways to make your blog sharing even richer, including the use of podcasts and videos, how to beat blogger’s block and all my best tips for growing your readership and building community. If you’re ready to explore what blogging from your heart means for you, click the “buy now” button below to start your journey with me today. The course runs for 30 consecutive days, kicking off the moment you sign-up. Each day you’ll receive a lesson straight into your in-box and on the last day you’ll also receive a gorgeous 132 page ebook of the entire course. Let’s do this! Access to a computer + the internet and an email address (all lessons are delivered via email). A notebook and a pen would be handy. Ideally you also have a blog so you can start putting what you learn into practice. WILL THIS COURSE TEACH ME HOW TO SET UP A BLOG? The course is broken down into six key sessions which will be sent to you one after the other (in other words there’s no break between sessions). Each session focuses on a particular theme and will be delivered in five emails (four lessons plus an interview with an inspiring blogger). The course runs for 30 consecutive days in total, starting the day you sign up. THE COURSE FEE IS IN BRITISH POUNDS – DO YOU ACCEPT PAYMENT IN DOLLARS/EUROS? Yes! Your currency is automatically converted when you check out using either a credit card or Paypal. To check the current exchange rate, visit this useful online currency converter. PLEASE NOTE: If you live in the European Union (excluding the UK) VAT will be added to the total when you check out. I DON’T HAVE A BLOG YET – CAN I STILL TAKE THIS COURSE? Absolutely — you’ll be getting lots of ideas for blog posts to get you started! No, this is the self-study version of Blogging from the Heart which means you work through the material in your own time. There is no Facebook group with this course. "I've engaged and been present in this e-course more than any other course I've done. It was like getting a big fat permission slip to be 100% myself with gently inspiring, soulful lessons. I'd totally lost focus on my blog and didn't have any energy to devote to it. This course made me re-focus what my blog and online space is all about and bring it all back home. It's made me love my blog space again. For the first time I feel relaxed about it, there was so much tension before. And I always knew this is how it could feel, because I'm not trying to be anyone else or fit a niche or a box. I am finding my own voice. I've got a sneaky feeling this course is one of those life changing moments for me somehow."